Nan A. Talese, 9780385543583, 240pp. A heartwarming amateur detective story set in Depression-era St. Louis from beloved author A. E. Hotchner. Street-savvy, almost-thirteen-year-old Aaron Broom is guarding his father's car when he witnesses a robbery gone wrong in a jewlery store across the street. To Aaron's shock, his father, a travelling watch salesman in the wrong place at the wrong time, is fingered as the prime suspect in the murder. Despite seeing the real killer flee the scene, Aaron can't do much to help in the moment--no one will take a kid's word for it. Undaunted, Aaron enlists an unlikely band of friends and helpful adults to clear his father's name. Aaron's unusual mission is complicated by the painful realities of the Depression: His father's longtime business folded, leaving the family in financial straits; his mother is in a sanatorium after nearly dying of tuberculosis. So Aaron is forced to fend for himself while his father is held in wrongful custody. He ducks truant officers and nosy neighbors, landlords and social workers, and he bums meals from friends and relatives alike. In his search for justice, Aaron draws upon the resources of a world-weary paperboy, an aspiring teen journalist, a kindly lawyer, and a neighborhood friend with a penchant for baking. And as they dig into the details of the case, these unconventional detectives reveal a cover-up that goes much deeper than a jewelry-store heist gone sour. Through it all, Aaron's optimistic narration and plucky resourcefulness shine through. Hotchner's latest is a rollicking ride through St. Louis at its lowest, as seen through the eyes of his most lovable narrator to date. A. E. HOTCHNER is the author of the international bestsellers Papa Hemingway, Doris Day: Her Own Story, Sophia, and his own memoir, King of the Hill. He has adapted many of Hemingway's works for the screen, and he is the founder, with Paul Newman, of Newman's Own. "A. E. Hotchner has created a wonderful, moving, action-packed novel. 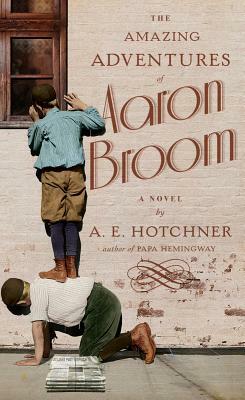 The Amazing Adventures of Aaron Broom will long remain a pillar of the American literary lexicon. Distinguish yourself and buy it now!" "Hotchner is always a wonderful read." "Everyone who reads Hotchner’s new novel will find a kindred spirit in young Aaron Broom. Each scene is vivid and every character authentic, as only a master of fiction could make them. Thoroughly enjoyable from start to finish." "Hotchner's storytelling is fast-paced, his feel for period detail sure-handed, his vision of humanity-facing-adversity persistently sunny, and his regard for the boy's resourcefulness contagious. A brisk, winsome caper." "Aaron’s efforts would make the Hardy Boys envious as . . . Aaron begins putting together the pieces of an intricate puzzle that will lead him to a court denouement reminiscent of Perry Mason . . . Hotchner has obviously lost none of his writer’s chops. With an appealing protagonist and a feel-good, slightly old-fashioned story, the venerable author’s latest is a diverting exercise in storytelling that is sure to delight his many fans."